This engine belongs to EJ series, which was firstly appeared in 1989 under the hood of Subaru Legacy. Two-liter EJ20 is the first motor of EJ family. It replaced the old EA82 1.8-liter engine and became the primary engine for each Subaru model. The EJ20 engine, as well as the predecessor, is four-cylinders opposed (boxer) gasoline engine. The engine has aluminum cylinder block with dry cast iron sleeves installed inside. The most common version of the naturally aspirated engine EJ20E has two single overhead camshaft cylinder heads (SOHC). The head has four valves per cylinder. The diameter of the intake valve is 36 mm, and the exhaust valve - 32 mm. The camshafts are driven by timing belt from the crankshaft; the timing belt requires changing every 60,000 miles. The EJ20E was produced in four history steps; each of versions differs by output power - 125hp, 135hp, 155hp and the last 140hp (at 5600rpm) engine for Subaru Legacy BL. Naturally aspirated DOHC engine name is EJ20D. This motor produces 150hp at 6800rpm. Subaru started producing SOHC engines with open block named as the EJ201, Ej202, etc. They have new SOHC cylinder heads, light pistons, and low revs tuned intake manifold. The power of the EJ201 motor is also 125 hp at 5600rpm. EJ202 is more powerful version due to the light cylinder block, 4-2-1 exhaust headers, and another intake manifold. It produced 138hp at 5600rpm and 138 ft-lb (187 Nm) at 4400rpm. The EJ203 engine is characterized by the presence MAF-sensor and an electronic throttle. 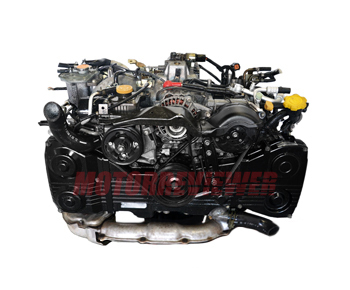 The EJ204 engine has double overhead camshaft cylinder heads and variable valve timing on the intake camshafts (AVCS). The power of EJ204 is 155hp (190hp - higher compression late version). The EJ series includes other displacement versions - EJ15, EJ16, EJ18, EJ22, and EJ25. FB20 engines already replaced simple naturally aspirated EJ20 engines. 1. Knocking noise from EJ20 Engine. The engine has a problem in the 4th cylinder. This cylinder is hottest; the cooling is worse in this place of the engine. In this case, the piston or rod starts knocking then the engine is cold at first and all time after some period. That requires an engine rebuild. 2. Oil leaks. Most often, the oil leaks out of camshaft oil seals and gaskets of cylinder head covers. Engine life of naturally aspirated EJ20 is around 150,000 miles (250,000 km) with proper maintenance.